Cream cheese pancakes are a super low carb pancake. They're delicate and super easy to make with only five ingredients. Top them with a little powdered sugar and some fresh berries for a complete and lightly sweet breakfast. If you’re on a Keto diet you can totally skip the powdered sugar to keep it the lowest carb content as possible. You can also leave out the maple syrup or replace it with an artificial sweetener. These pancakes are very delicate but they flip pretty easily, so you can actually make them a good size if you want. Beat the cream cheese and maple syrup in a medium sized bowl. Add in the eggs and vanilla extract, and salt and beat until fluffy and well combined. Heat a griddle or cast-iron skillet (any non-stick pan will work great!) on high heat. Lower the heat to medium-low and add the butter to grease the griddle. You can also use non-stick spray. Pour the batter onto the griddle in your desired shape and size. Cook the pancakes for 1 to 2 minutes and then flip. The pancakes can burn easily, so make sure to keep the heat on low. Cook the pancakes for another minute or until the pancake is golden brown on both sides. Remove them from the heat and keep them warm in the oven if you are making a large batch. Serve the pancakes in a nice stack with a little powdered sugar and berries. Or any of your favorite pancake toppings! Make sure the cream cheese is softened before you start making this batter; otherwise you will end up with lots of lumps. Beat the batter well to help make the pancakes have a delicate texture. The pancakes will be thin. There is no leavening agent so they won’t have any rise!. You can switch up the sweeteners in these pancakes. Try out different natural sweeteners like coconut sugar or agave syrup. You can also substitute sour cream for the cream cheese. You can also add flour and leavening if you aren’t looking for a low carb pancake but want the fluffiness and tang from the cream cheese. Add in 2 cups of flour, 1 teaspoon of baking powder and ½ a cup of milk. These pancakes will be super fluffy and tender! 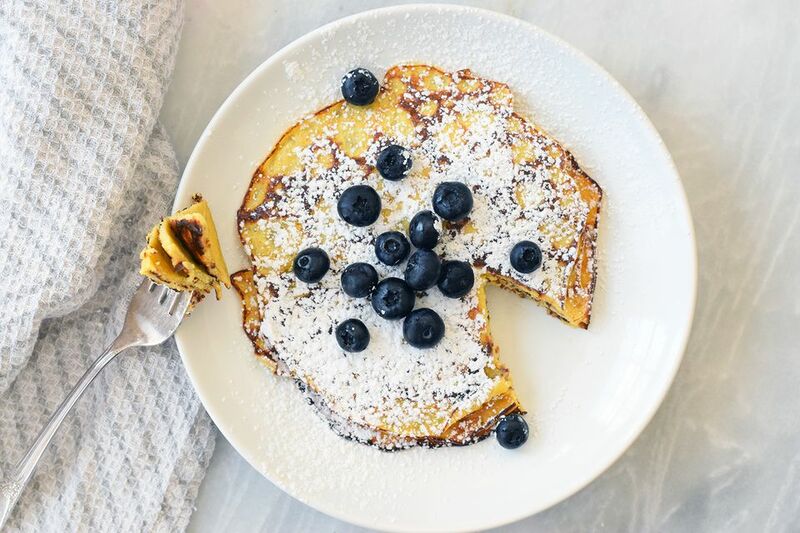 They won’t be low carb, but they will taste amazing and are a fun spin on traditional pancakes.